A land woven with culture. A land woven with legends. A land woven with traditions. These are the words that greet you when you navigate to the home page of Takiwā Tourism, a collective of contemporary Māori tourism ventures, owned and operated by Ngāi Tahu whānau members. These businesses are committed to showcasing the unique landscape, waterways, and wildlife of Te Waipounamu and its southernmost islands, to an increasingly international market. Over the last few months, kaituhi ANNA BRANKIN has visited a number of these tourism ventures to learn more about the Māori tourism craze that is taking the industry by storm. Indigenous tourism has been a particularly fast-growing trend in recent years, with more travellers seeking a meaningful interaction with the traditional culture of the countries they visit. Here in Aotearoa – already a popular tourist destination – more than half of international visitors are likely to take part in experiences where they learn about Maōri culture. This presents an opportunity for flax roots tourism that gives travellers a genuine understanding of the history and values of Māori culture. Takiwā Tourism provides just that, by inviting its customers to experience a range of tourism adventures within the takiwā of Ngāi Tahu, which makes up approximately 80 percent of Te Waipounamu, as well as Rakiura and the surrounding islands of Foveaux Strait. The unique selling point of Takiwā Tourism is the connection it offers to the history and traditions of Ngāi Tahu through the whakapapa of each business owner. The idea for Takiwā Tourism originated in the Tribal Economies unit at Te Rūnanga o Ngāi Tahu, when former staff members John Reid (Ngāti Pikiao) and Ben Te Aika (Ngāi Tahu) visited Māori Tours Kaikōura, owned and operated by Maurice and Heather Manawatu. For several years the idea germinated until Project Lead Kelly Barry (Ngāi Tahu – Wairewa) breathed life into the plan. “Culture can be experienced in many ways, and our focus is on creating opportunities for manuhiri to experience the living, breathing culture of Ngāi Tahu,” says Kelly. Above: Maurice and Heather Manawatu, owner/operators of Māori Tours Kaikōura. 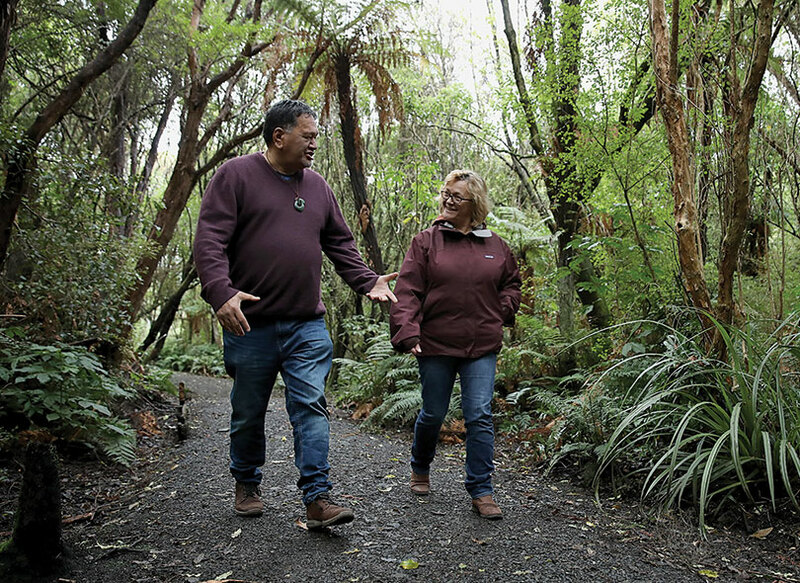 To date, this fledgling network consists of three well-established tourism ventures – Māori Tours Kaikōura; Te Ana Māori Rock Art Centre in Timaru; and Ulva’s Guided Walks on and around Rakiura. Also, there are three new ventures that have started up in conjunction with Takiwā Tourism – Karitāne Māori Tours, just north of Dunedin; Hīkoi Waewae in Hokitika; and Mana Charters in Bluff. These newer businesses have greatly benefited from the connections and mentorship they receive as a part of Takiwā Tourism – something I learned first-hand when I travelled to Bluff to meet Shane and Miriona Bryan, who have been running Mana Charters since December 2017. The couple have spent most of their lives on the sea in one way or another, and leapt at the opportunity to own their own business. Takiwā Tourism provided Shane and Miriona with the training and mentorship they needed to get their business off the ground, but most importantly, has provided them with a unique platform to set their charter apart from others operating in the area. Above: Shane and Miriona Bryan, owner/operators of Mana Charters in Bluff. I was lucky enough to take part in one of Miriona and Shane’s fishing charters, and as we motored through the choppy waters of Foveaux Strait I imagined what it would be like to visit Aotearoa for the first time – to see the rugged southern coastline and craggy islands while hearing about the longstanding connection Ngāi Tahu has shared with this area. It would be an experience unlike any other. This is perhaps one reason that the well-established company Ulva’s Guided Walks has always been so successful. The indomitable Ulva Goodwillie is from a whānau of Rakiura Māori, and she grew up immersed in the stories and landscape of her tīpuna. These days, she puts that knowledge to good use in birdwatching tours on and around Rakiura. One of her most popular tours is a half-day guided walk on Te Wharawhara, or Ulva Island, situated in Paterson Inlet (Te Whaka a Te Wera). Te Wharawhara was never milled for timber, and has been pest-free since 1997. The tour meanders through towering ancient trees full of thriving populations of native birds, and Ulva’s genuine passion for the birdlife is both endearing and infectious. We have only been on the island mere minutes when she spots a toutouwai (Stewart Island robin), and immediately scratches up a patch of the forest floor so the diminutive bird can scrounge for bugs in the freshly turned dirt. “Hello baby,” Ulva croons as she gazes at the robin affectionately, before making sure that all members of the tour have had the opportunity to take a photo. Ulva’s knowledge of the native flora and fauna is prodigious, and I come away from my tour having learned that the kūkupa, or kererū, our native woodpigeon, is the only native bird left in Aotearoa that can eat the fruit of some of our larger trees; and thereby harvest and distribute the seeds. I have learned the legend of how the tīeke, or saddleback, acquired the distinctive red-brown mark across its back: when the bird ignored a request from Māui (fresh from his battle to ensnare the sun), he seized it with his fiery hand and left a scorch mark across its back. Above: Ulva Goodwillie of Ulva’s Guided Walks pointing out the spiked leaves of a horoeka (lancewood). Before I leave, Ulva tells me to make sure I call in on her friends Shane and Miriona in Bluff – a sure sign that the collective values of Takiwā Tourism are alive and well. 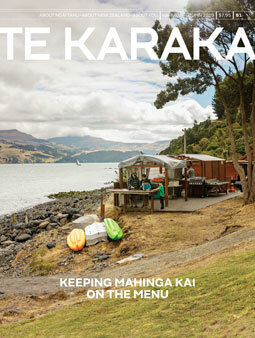 My final destination is one of Takiwā Tourism’s newest experiences – Karitāne Māori Tours. Owned by Kāti Huirapa ki Puketeraki, with the support of Hauteruruku ki Puketeraki Waka Club, this waka adventure is as authentic as it gets. The meaning of place-based narrative becomes clear as [Alex Whitaker of Karitāne Māori Tours] tells us the story of the legendary siege [of the pā of the chief Te Wera on Huriawa Peninsula] led by Taoka, who wanted to starve Te Wera and his people out – not knowing that a freshwater spring stood within the walls of the pā, and that the coastline supplied them with the kaimoana they needed to survive. The business is managed by Alex Whitaker and Tania Turei, a husband and wife who have been part of the waka club for a number of years. It is staffed by four local guides. The unique tour begins with a tutorial on the ancient tradition of waka, before we take to the water to paddle and sail on the Waikouaiti River, as Alex shares the history of local landmarks such as maunga Puketapu and Hikaroroa. 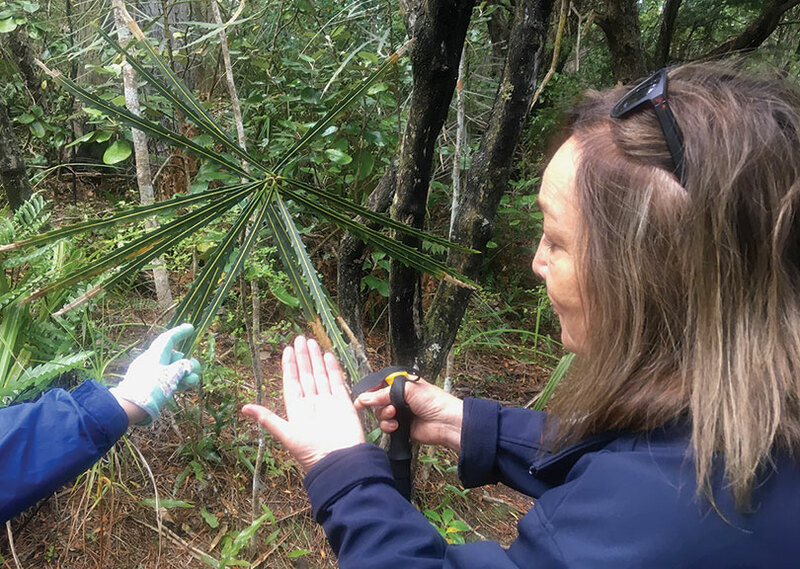 We land on Ōhinepouwera (the Split) and plant harakeke – our contribution to the 200-year plan the rūnaka has developed to replace exotic species with native plants. Alex then draws our attention to the distinct outline of Huriawa Peninsula and the pā of the chief Te Wera. The meaning of place-based narrative becomes clear as he tells us the story of the legendary siege led by Taoka, who wanted to starve Te Wera and his people out – not knowing that a freshwater spring stood within the walls of the pā, and that the coastline supplied them with the kaimoana they needed to survive. When the tour is over and we are enjoying some kai back at the office, one of the international tourists tells me what drew him to pick up the brochure for Karitāne Māori Tours: the fact that it offered an authentic cultural experience that was unlike anything he’d seen before. And at the end of the tour, he felt that he had found exactly what he was looking for. Karitāne Māori Tours is in good company amongst their fellow businesses at Takiwā Tourism – a growing collective of Ngāi Tahu owned and operated experiences that truly embody their slogan: our stories, told by our people, in our place.